Type the desired laser engraving exactly as you'd like it to appear. Include font choice (style), size and engraving location (center, top, bottom, etc). Also include a cell phone number, so a "proof" can be sent for approval prior to engraving. The craftsmen at tricia16designs will hand select a beautiful reclaimed piece of mesquite, pecan, oak or cedar to craft into a one-of-a-kind wedding or anniversary guestbook. Pieces measure 12" to 18" in width (varies according to knots, areas where branches grew, etc) with 2 LIVE EDGES and available in up to 4 feet in length. See the drop down menu for length options. After planing and sanding, finished thicknesses will range from about .5" to about 1". We will also finish your piece using multiple coast of polyurethane to both front and back. After signing by your guests, (using a sharpie or even ball point pen), the piece may be hung, leaned against a wall or laid flat. Please advise if intended final use is to be hung and we will attach hanging hardware at no additional cost. 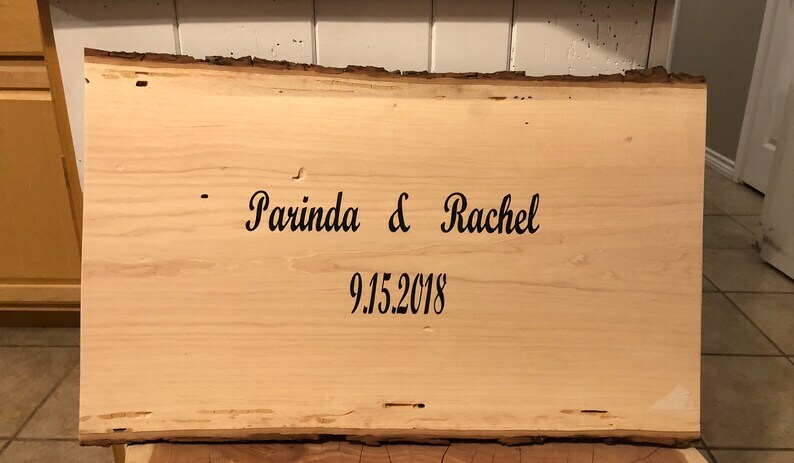 This listing INCLUDES laser engraving of your names and date on the wood slice. Longer or additional text will be quoted in an individual basis. Please include desired names and date in the notes to seller area upon checkout. Engraving on the samples read "Welcome to our special day" and "It was always you", but you may choose anything you wish. To purchase this item, (using mobile device), select the LENGTH from the light gray drop down menu directly below the price. Once Length is chosen, you'll be able to tap the orange "Add to cart" bar. When you are ready to checkout (you can keep shopping and adding items to the cart as you wish), you will click on the cart and scroll down to the "How you'll pay" section where your available payment options will be shown. Next, tap the "Proceed to checkout" bar where you can checkout as a guest or you can sign in if you already have an Etsy account. Etsy will process the payment as sellers never see your account information and you'll receive an email notification t hat an order has been placed. Free Shipping to continental US only using FedEx Ground. Local pickup is also welcome and encouraged. Please convo me for exact location specifics (Central TX). This is a completely natural wood product, cut from logs on a sawmill. You may find some saw dust residue on it, the bark will flake and/or peel somewhat and in some cases the bark may be completely gone. The surface may also lightly crack as it dries out. We are literally cutting these from our woods and shipping them to you! None of this will affect their intended purpose and is completely a natural characteristic of a fresh cut wood product. We just want you to know. The measurements listed are the approximate size (rounded down to next full inch) across the widest part of the slice. As the trees are not completely round to start with, it may be less wide at another part of the piece. If you have concerns about the size and/or shape, please feel free to convo me with any questions. As you can see from the photos, these are "imperfectly perfect" - trees can grow in some unusual shapes and are rarely perfectly round. Each is unique, but as beautiful as these shown. If you would like a photo of the piece I select for you, please leave me a message in the “note to seller” section upon checkout. Please visit the shop home and view all available sizes, listed in the "sections" areas. We offer wood slices ranging from 4" in diameter to over 24" in diameter as well as thicknesses from 1" to over 6". Most likely, what you're looking for is already listed in one of our sections. Most items are not sanded or finished prior to shipping, but we do offer this service for an additional small fee upon request. Look for the "sanding/finishing" upgrade listing and add it to your cart along with the wood slice you have selected.